FUN FACT: Sharp makes the Kin One. They also made the T-Mobile Sidekick, which Microsoft now also owns. • Quick, Streamlined OS: The centerpiece of the KIN phones is the new operating system. Simple and streamlined, you can become familiar with the ins and outs of the system very quickly. There are only three main screens that you cycle through by sliding your finger to the right or left. If you somehow ever get lost, the "Back" button located beneath the screen brings you back to the home screen. • Kin Loop: That home screen is the Kin Loop. The Loop allows you to easily connect to your various social networks (as long as it&apos;s either Twitter, Facebook, or Myspace), all on one screen. You can even have your favorite RSS feeds loaded up. It may seem daunting, but it works really well—although it can get a little crazy, depending on how many friends you have. Still, many phone companies have attempted to consolidate social networks, and this is one of the best we&apos;ve seen yet. • Easily Share Everything: On the bottom of the Kin One screen you&apos;ll see a little green dot. This is called the Kin Spot, and is how you share everything with your online friends. If you&apos;ve taken a photo and want to put it on Facebook, just drag it to the Spot. Same with web pages and basically everything else one would want to share. It&apos;s pretty damn cool. • Built-In Zune Player: Microsoft may never come out with a Zune Phone, but if the implementation in other Windows Phones is anything like this, they won&apos;t have to. Tap the "Music & More" button and you&apos;re brought to a slightly pared-down version of the Zune player. From there you can play videos and music stored on the 8 gigs of internal memory, or stream music with your Zune pass. The experience is on par with the iPod software in the iPhone. • Full HTML Browser: Though the 2.6-inch screen is small, it&apos;s easy to browse the web using the Internet Explorer-based browser. Simple, familiar gestures make for ease of operation. • Verizon Network: We never lost coverage using the Kin. Browsing speeds were always fast, no matter our location. • Convenient Size, Convenient Price: Some found the Kin One to be too small and too awkward in shape. We disagree. After three days with the Kin One, we became very comfortable with it. The soft-touch back and glossy front played off each other well, and it was light and small enough to basically disappear. • No Calendar: For all its connectivity to various social networks, there&apos;s no way to keep track of all the events your friends may invite you to. • No Map: Even more glaring is the omission of a map app. Besides the Internet browser and the actual phone function, map apps are the ones we use the most. That by itself is reason enough for it not to be our main handset. • No IM: For a phone meant to keep people connected, it seems odd to have no built-in instant messenger. • No Apps: "Apps" is the hot-button word for phones these days, because people want to be able to customize their phone with different applications that speak to who they are. You can&apos;t do that with the Kin. Whatever Microsoft gives you is what you get. So if a new social network takes off next month, you&apos;ll have to wait for them to implement it into their software in order to use it on your phone. FINAL SAY: The Kin One is not meant to be a smartphone. Yes, it comes with a great MP3 player and a full QWERTY keyboard, and yes, you can surf the web with a full HTML browser, but to compare it to BlackBerrys, Android phones, and the iPhone is unfair. For $50, you get a phone that allows you to easily stay connected 24/7 to Facebook and Twitter (MySpace, too, but who uses that?). If you need robust emailing capabilities or the ability to download apps, this isn&apos;t for you. Just think of it as the new T-Mobile Sidekick. 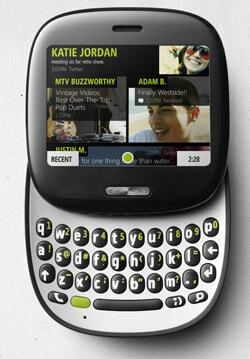 People loved the Sidekick for its ability to keep them connected to their instant messenger friends. The Kin looks to do the same for Facebook and Twitter. And it does a pretty good job.